Protection Engineering Consultants (PEC) developed a soil model and landmine modeling strategy for LS-DYNA that resulted in excellent agreement with data from carefully controlled, precision tests. A traditional all-ALE approach and a less conventional all-SPH approach were evaluated, as well as hybrid formulations. Regardless of the modeling strategy used, the accuracy of landmine blast load predictions is strongly driven by the fidelity of the soil material model. PEC has developed a sandy soil model specifically for landmine simulations, which requires only two inputs: dry sand density and moisture content. Comparisons with data from two precision test series were exceptionally strong and the average error for predicted impulse was less than 2.5%, using a priori material parameter settings. This approach was employed to study the effects of disturbed soil above the landmine as occurs in live fire tests, where a hole is excavated, the landmine placed and the soil backfilled above the mine. Read more in the full PEC Publication by David Stevens, Ph.D., P.E. and Matt Barsotti. 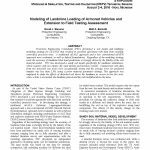 Modeling of Landmine Loading of Armored Vehicles and Extension to Field Testing Assessment. CORRECTION: Following the conference publication, it was determined that the landmine load predictions shown in Figure 9 for prior modeling by Len Schwer was inaccurately reported. While the data cited is correct per the 2012 citation listed, a subsequent 2013 paper by the same author indicated notably better accuracy when full 3D geometries were used. The conference paper linked here has been amended with a corrected plot, and Figure 9 has been annotated to indicate the correction. Schwer, L. and T. Slavik. Buried Charge Engineering Model: Verification and Validation. in 9th European LS-DYNA Conference. 2013.